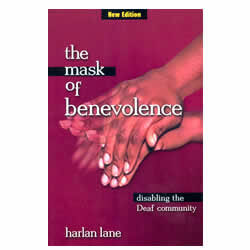 Mask of Benevolence is essential reading for people who want to understand the gap between two cultures - Deaf and Hearing. Has a new preface and new chapter about the science and ethics of cochlear implants. An award winning book when first published, this expanded version is still startlingly fresh. A must read for anyone in contact with the Deaf Community. Pages 360.